Reinventing scout camps for scouting groups of all affiliations. Whitewater rafting trips are a great way for your scout group to play together outside in nature. We have a variety of river rafting trips for you to choose from so that you can pick the one that best fits your scout group. From trips for those 8 years and older, to more adventurous trips limited to those 14 years of age and older for older scouting programs. We’d love to help your scout group to grow closer together through a one or two day white water rafting adventure. Rock-N-Water is a high adventure Christian Camp located an hour West of South Lake Tahoe in California. 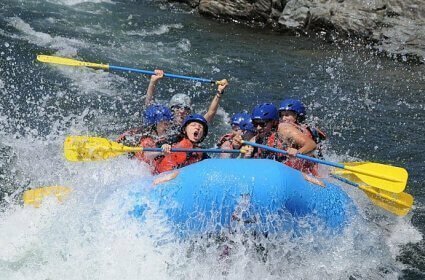 We have been leading scout groups whitewater rafting since 1989. Our Christian staff are not only trained camp counselors, but also outdoor adventure guides. It’s our passion to not only get youth groups into nature, but to also help them to experience the joy of God’s living word through those outdoor experiences. Every trip we lead includes time intentionally set aside for Biblical devotionals. Be your group a part of Scouts BSA (formerly Boy Scouts of America), Girl Scouts, Trail Life, American Heritage, Pathfinders, Frontier, Navigators, or Royal Rangers… We can worth with your leadership team to determine the amount of religious programing that is appropriate for your group. If you have any questions or want to customize your scout camp, please contact us. We’d love to answer any questions you might have.